There is no native way of synchronizing your Outlook tasks to iPhone directly as of today. You can synchronize your e-mail and calendar using the Outlook Exchange protocol, but that protocol does not support tasks. Many developers have made efforts to work around that issue and created third party tools that allow you to synchronize via cloud services such as Remember the Milk or ToodleDo. These services will all get the job done, but if you are a Google Mail and Calendar user like me, the more natural cloud service for my tasks would be the Google Task list. This is the alternative I will present in this article. 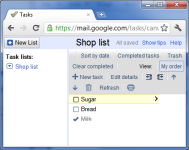 The Google Task list is a service that is available both through GMail and the Calendar, or at the standalone interfaces Google Tasks Canvas or the Hand-Held Device Interface. See screenshots to the right. To synchronize with Outlook using Google Tasks as the "man in the middle", you'll need two applications: one at the iPhone and one at the computer running Outlook. There are several tools for iPhone that will let you work with Google Tasks, for example GeeTasks or GoTasks. I've tried GoTasks, so that's what I'll be using as an example here. I'm sure you can find other alternatives if you search for it, but I'm not sure you'll really need one. GoTasks gets the job done and has a good and intuitive user interface. This, and it's free! Here the only tool I know of is called GogTasks. Incidentally, I'm also the developer of this tool, so a little disclaimer goes out right now ;-) They say that all developing projects starts because the developer wants to "scratch their own itch", and that is also the case here. I needed to get my daily life organized, not forgetting things that needed to get done, and I discovered the lack of a sync tool between Outlook og Google was a hindrance. So I made GogTasks, and this tool will be the second element in getting the iPhone-Google-Outlook-sync up and running. 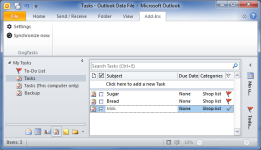 GogTasks works for both Outlook 2003, 2007 and 2010. You can set it up to synchronize at a regular interval so you basically don't need to worry about it being there at all. As soon as you've configured GoTasks and GogTasks to sync against your GMail account, there's not really much to it. Synchornize your tasks, and they will be available wherever you are - on the bus with your iPhone, by your work computer with Outlook, or from the internet café by the beach when you're on vacation (not that you'd really want to get anything done at this time :-). Is there any way to view AlL lists at once in Google Tasks Canvas? This has been torturing me.